In order for designers to thrive they must respond to the world around them. 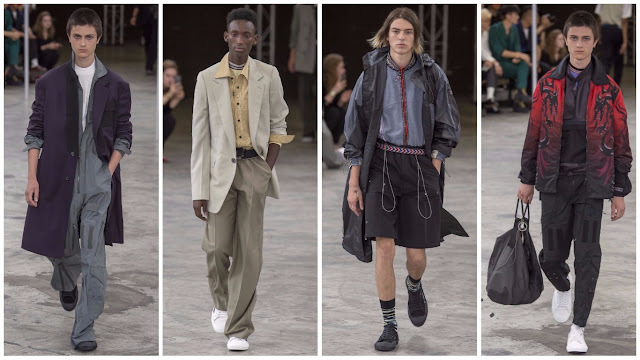 For Lucas Ossendrijver at Lanvin—where he designs menswear—he was thinking about the chaos of the tumultuous times we live in. The show was presented in June, shortly after the London Bridge attack and ahead of the summer which saw the horrific politically-motivated vehicle-ramming attack against counter-protestors in Charlottesville, North Carolina and terrorist attacks in Barcelona, Brussels, Turku. This isn’t to mention the incessancy of President Trump’s war on the media, constant administration changes and controversies; the aftermath of Brexit, effects of which are still being felt. On a personal level, more and more, as a society, we are consumed by our mobile phones and social media. Ossendrijver’s approach could be likened to an Instagram or Pinterest feed this season. He was studying the contradictions, contrasts of modern dressing. Workwear vs activewear, sportswear vs relaxed attire. He collaged his ideas on single outfits. It was this curatorial response that I rather appreciated. He paired grey boiler suits with sharp coats, buttoned down shirts with loose trousers, double-breasted trench coats and shorts. The aim was to instil the show with a relaxed ease. Ossendrijver wanted to eradicate the sharp rigour, in favour of dressing the man of today in something less strict, more decontracté. The scenography wasn’t exactly casual. The models crisscrossed the runway with a rapid, determined pace. As many noted, the finale was like a rush hour scene. Perhaps that was the beauty in it being something for everyone. These clothes could be transported to any street worldwide, exist alongside each other, amidst the chaos. The idea here was to present something for everyone. Ossendrijver noted the increased amount of options. Presenting a wide variety of clothing does eliminate the possibility of cohesion. It also points to wider, internal issues at the brand. Following disagreements between Alber Elbaz and Shan Lan Wang, Elbaz was suddenly fired. Since the house has experienced difficulty on the business front, with sales plummeting. In the womenswear wing, Bouchra Jarrar, Elbaz’s successor, departed after only a year at the house before being replaced by the incoming Olivier Lapidus, who is responsible for the creative direction of the brand’s restructuring as a “French Michael Kors”. Meanwhile, Ossendrijver has been charging full steam ahead for the past twelve years. One hopes his stride isn’t damaged by this restructuring for he is truly the brand’s best kept secret—he isn’t a famous designer but he is a famously good designer. Despite the missed opportunity for Spring 2018 as a consistent body of work, there are pieces here that will undoubtedly sell like hotcakes.